Happy Shoesday Tuesday, fellow shoe lovers!! 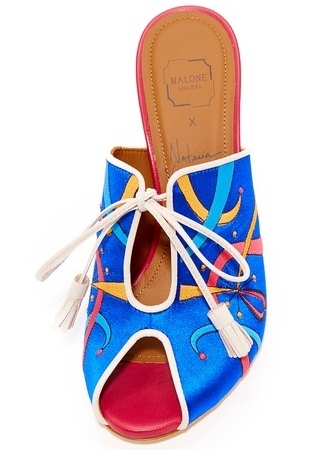 join us in drooling over these stunning and eye-catching pair of Malone Souliers X Natalia Vodianova Natalia Mules. Proving that two (fabulous fashion) heads are better than one, today we celebrate the beautiful result from the collaboration between Malone Souliers and Model/Actress Natalia Vodianova. 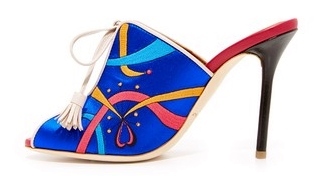 These gorgeous peep-toe Malone Souliers mules boasts detailed and colorful embroidery on a satin upper, tasseled leather lace ties to secure the notched top line, a keyhole cutout on the vamp, and a very sensual 4 1/4" covered stiletto heel. While this style comes in another colorway, we're completely captivated by this blue/light grey/red/black version. 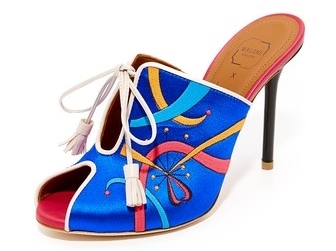 If your budget and wallet allows, grab this divine mule for $635.00 on www.shopbop.com.